Sipsey Street Irregulars: Endangered species sighted at local WalMart. I had to stop by WalMart to pick up some medicine yesterday morning and out of idle curiosity I stopped by the sporting goods department where an employee was putting up the latest restock. 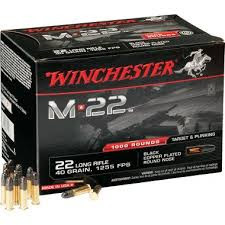 Lo, and behold, what did I spot but a single cardboard box containing 2 1000-rd bulk packs of Winchester M-22 .22LR ammo! I had the fellow unbox and scan them and they were $49.95 each. That's the first time in darn near a year that I've seen bulk pack .22 ammo at a decent price. With the local tax, they would have been five and a half cents a round. I'm sure someone scarfed them up quickly. TWO 1000 round bulk packs? For a whole Walmart store? YIKES! I guess there's still pretty Slim Pickens for 22LR, eh? And now, just when it starts to get a little bit better, Dear Leader's got to get things stirred up again. Good grief. I have been seeing Winchester Super-X 100 round plastic slide boxes at Cabela's on a regular basis, limit 5 per customer. There have also been CCI Mini-Mags in the 100 round plastic slide boxes at Hoffman's Gun Center in Newington, CT. Since I have plenty on hand and no room in my ammo storage magazine, I have been leaving it for others. Just the kind of guy I am. Mike, I know you're up in Pinson, but at the new outdoor store here in Hoover they have pallets of Federal .22lr in 325rd boxes. I picked up a case (10 to a case so 3250rds) a month ago, but was in there the other day and they still had plenty of it. Mike, I know you're up in Pinson, but at the new outdoor store here in Hoover they have pallets of Federal .22lr in 325rd boxes. I picked up a case (10 to a case so 3250rds) a month ago, but was in there the other day and they still had plenty of it." If that is AM22 Match ammo, STAY AWAY FROM IT! That is the worst .22LR ammo I've ever had. Out of about 150 rounds, I had 2 squibs, one fail to fire, and the scariest one was a delayed fire. I will only shoot it out of my .22 S&W revolver so it doesn't jam a gun and is easier to clear the stuck bullet from the barrel. I bought my box in 2013 LOT#1GJ531, so it may be better, but I still won't buy it.